At the 2017 Microsoft Build Conference, the company announced the Fluent Design System, Microsoft’s new design language. Fluent was no secret. Developed under the “Neon” codename, Fluent adds translucency and animation to Microsoft Design Language 2, the design system used for Windows 10. MDL2 was not a name of choice for Microsoft. After getting burned with Metro, Microsoft had to quit using the name and settled with a rather uninspiring Microsoft Design Language for their UI/UX efforts. And while “Neon” sounds great, Microsoft decided to play safe and use “Fluent Design System” to describe their design style. Is Fluent the Design System of the Future? It was about time for Microsoft to give an official name to their design style, especially since it was one of the first flat design adopters with their metro style. By the way, Microsoft doesn’t want you to refer to Fluent as a design language but rather as a design system. With Fluent, Microsoft puts emphasis on interactivity rather than on appearance alone. Fluence is not only a design paradigm for traditional screens and inputs, but it’s also a vision for revolutionary user interfaces. 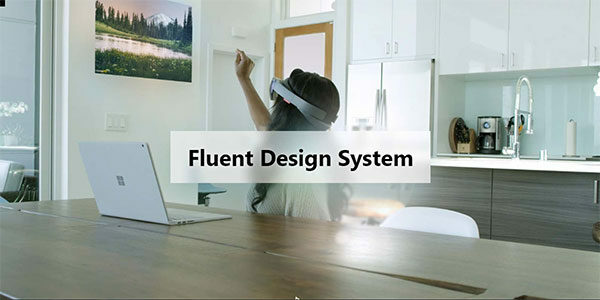 Fluent is aimed at various form factors such as virtual reality, augmented reality, phones, tablets, desktop PCs, wearables or games consoles. Unlike Microsoft Design Language 2, a.k.a. Modern, that was built with a focus on touch, Fluent will work with various touch inputs such as motion controllers, gestures, voice, pen, etc. Fluent is different from the typography-oriented Metro. Fluent will allow Microsoft and developers to craft cross-platforms experiences and interactions that are harmonious, modern, inclusive and responsive. Light describes a distraction free interface that focuses on the specific interaction between user and interface. Depth uses multiple layers to add expression and continuity between elements and objects. For Motion, Microsoft establishes contextual relationships and connections between interface elements. Will make use of screen estate to deliver legibly and clutter-free content. The most interesting is Scale. Microsoft envisions interfaces that go way beyond 2D and typical displays to new form factors including VR and AR. It’s not scale by dimension but scale by medium. Get Started with Fluent … Not So Fast! FLuent is not quite ready for prime time. For now, you can have a look at the design guidelines for UWP apps, but they are not quite the same as what Fluent stands for. You may also want to have a look at Acrylic material for creating transparent textures, Connected animation to get an idea on animation the Microsoft way, or at Reveal to test depth and focus, but it’s not yet the real thing. Judging by Microsoft’s wording, Fluent is way more complex than what MDL2 is now. Even Microsoft’s own apps are somehow disconnected with Fluent as they lack the five distinct traits of the new design language. It looks like we’ll have to wait until autumn when Microsoft will deliver the Fall Creators Update. Until then, have a look at Groove music app that introduces lur and hover, to get a sense of what Microsoft is aiming for. At this point, it’s obvious that Fluent’s scale won’t fit Microsoft’s six-month update cycle. Further, the much-anticipated Creators Update that got shipped last months failed to impress, at least design wise. Will Microsoft manage to succeed where Google and Apple are still struggling? One thing is for sure, Microsoft is about to get more transparent. And not only on Windows. If you are eager to meet Fluent, hop on the preview builds of Windows 10 Redstone 3, and … wait. A great first look. I wasn’t aware of this until I saw your post. Thanx for taking the time to share. Does that mean you guys will be soon producing a Framework that leans on Fluent? I think it will find it’s way. With Material Design now a thing, I remember when we were all introduced this feels a lot like that. When I started reading this my first though was “Ahh, another one?”….yeah I’m aboard with this. – Yeah, lets put parallax, some 3D, motion graphics from AE, Material Design from Google, Scaling from CSS3, some lights from iPhone, some depth from Crysis, and … some more 3D, yeah, definitely!!! WE CALL IT “THE FLUENT”. – Great, awesome, EPIC! Our grandsons will remember us for this incredible new footprint in web development.